LOWELL, Mass. - Sophomore forward Chris Maniccia (St. Catharines, Ontario) notched his first career hat trick as the No. 8 UMass Lowell hockey team completed the Hockey East weekend sweep with an 8-2 win against New Hampshire on Saturday night at the Tsongas Center. Sophomore forward Evan Campbell (Port Coquitlam, British Columbia) got the River Hawks (5-1-1, 3-0-0) on the board first with a power play goal at 9:15 of the first period. Maniccia's first goal doubled the lead 35 seconds later when he slotted the rebound of a Jake Suter (Lac du Flambeau, Wis.) shot into the net. The Wildcats (2-4-0, 0-2-0) cut into the deficit off a highlight-reel goal from Collin MacDonald. The junior gathered a loose puck just inside the blue line and dangled around Jeff Smith (Maple Ridge, British Columbia) for the goal to make it 2-1 at 13:07. UMass Lowell did not waste anytime regaining the two-goal deficit when Tyler Mueller (Regina, Saskatchewan) fired a wrist shot from in between the faceoff circles 34 seconds later. Mueller received a pass from Campbell and let it go for his first career goal. Maniccia then scored his second of the game, and third of the season on a breakaway to make it 4-1. He gathered the loose pack around center ice and went in with a defender trailing him and beat Adam Clark stick side. Michael Colantone (Cave Creek, Ariz.) extended the lead to 5-1 with 2:23 left in the second period with a shot from the top of the left face off circle. A.J. White (Dearborn, Mich.) corralled a loose puck at the side boards and sent it to Colantone for the junior's second goal of the season. New Hampshire's final goal come off the stick of Maxim Gaudreault at 12:23 of the final period His shot from in front of the net beat Smith high and knocked the water bottle off the net. At 13:21 of the third period Maniccia completed the hat trick to make it 6-2 when he regained a loose puck, skated in front of the net and beat Clark once again. Maniccia added an assist on Ryan Collins' (Newton, Mass.) first career goal at with five minutes left in the game to cap off the night with a career-high four points. Collins shoveled home a rebound off the original shot from Maniccia. Colantone added his second of the game at 18:37 on the power play. Suter fired a shot from the point and Colantone put his stick out and tapped it home. The River Hawks scored the game's only power play goals (2-for-6), as New Hampshire went 0-for-3. The Wildcats had a 5-on-3 advantage for 1:29 at 9:25 of the second period. Smith made a career-high 27 saves in his second collegiate win, including during the two-man advantage for the Wildcats. The freshman slid across his crease to make a diving stop on Dan Correale at 8:01. New Hampshire outshot the home team 29-21, with help from Richard Boyd and Harry Quast, both with four shots. Maniccia also added four shots for the River Hawks in the victory and went 13 for 16 (81.3%) in the faceoff dot. 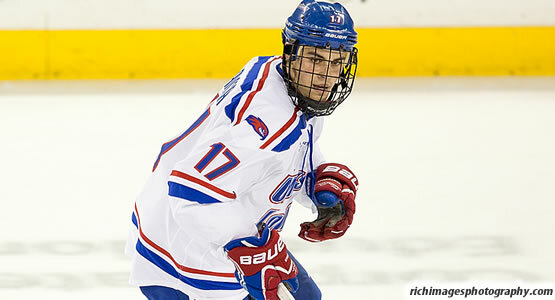 The last UMass Lowell hat trick occurred was on November 18, 2012 against Massachusetts. Riley Wetmore lit the lamp three times as the River Hawks won that game 8-2 as well. The River Hawks return to action on Friday, November 7 for Military Appreciation Night, when they welcome the Northeastern Huskies to the Tsongas Center for a 7:15 p.m. faceoff.